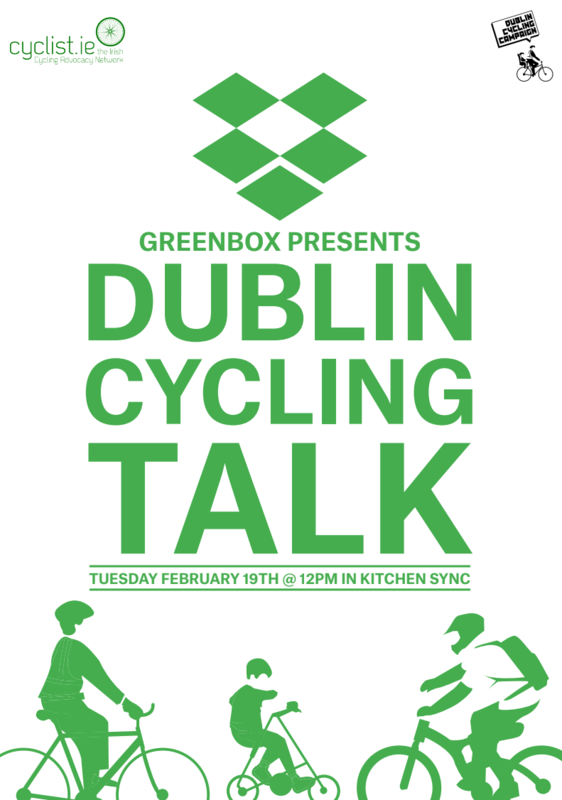 The latest tech company to invite Dublin Cycling Campaign and Cyclist.ie to give a lunchtime lecture on cycling safety was Dropbox. Dr. Mike McKillen and Dr. Damien Ó Tuama were delighted to accept the invitation to cycle over to their very swanky offices on Hatch Street and spend an hour updating employees on what is happening in cycling in Dublin - and setting out the Campaign’s vision for cycling in the city. What was of most interest though to their very large cycle commuting population was the subject of common cycle collision types on Irish urban roads, and how to avoid them. ‘Left-turn hooks’, being ‘doored’ and getting entangled in tram tracks or destabilised by badly reinstated road openings were some of the scenarios discussed. It was extremely encouraging to see so many of Dropbox’s employees either cycling or walking (or indeed scooting) to work. It was also pleasing to see them taking a serious interest in learning about the City Council’s and National Transport Authority’s plans for making Dublin more bicycle friendly, and indeed in understanding why the development of cycle friendly streets moves at a near glacial pace! There was an appreciation shown for the great campaigning work being advanced by Dublin Cycling Campaign and Cyclist.ie which was great to hear. We hope to connect in again with Dropbox on future events such as our Liffey Cycles. If you are working in a company with a lot of employees who cycle (or indeed who might potentially cycle) and would like to invite in some experienced cycling advocates to address an audience on topics such as the above (say in a lunchtime session), we would be delighted to hear from you. See here. Please note that, in return, we do ask companies to make a donation and/or plug us into their Corporate Social Responsibility programmes so as to support the work we do on behalf of Dublin’s cyclists. The greater the human and financial resources we have in the Campaign, the bigger the impact we can make.